October 23rd and 24th, 2015, SECAI leads Full STEAM Ahead!! Closing the Gap in STEM Subjects through the Arts for K-8 teachers in eight counties in Southeastern North Carolina. 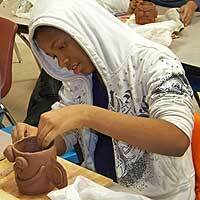 The workshops are sponsored by Wilmington’s Cameron Art Museum. They follow a series of professional development sessions on Closing the Gap in Literacy through the Arts. The workshops are fully funded by Duke Energy and The Corning Foundation, so they are free for teachers from New Hanover, Brunswick, Bladen, Onlsow, Pender, Columbia, Sampson, and Duplin counties. There will be follow-up half-day workshops in each of the eight counties on using the arts to teach Science, Technology, Engineering, and Math. We express our gratitude to the Cameron Art Museum, especially Martha Burdette, Curator of Education, and Anne Brennan, Director, for their deep commitment to education, and to Duke Energy and The Corning Foundation for their generous support.